This chapter highlights the essential role of discourse in learning and the development of physicians’ professional identity. Shared understanding and co-construction of clinical experiences—and learning—are mediated through talk. We argue how contemporary continuing professional development focuses on knowledge acquisition that is divorced from authentic clinical practice. We provide examples of structures that strengthen collective learning processes and steer the discourse of practice in ways that promote learning. Patient focused-quality improvement projects and simulations aligned to workplace needs could meet the requirement for continuous professional development to be both measurable and linked to authentic practice. Future work could usefully further explore how steering the talk of practice can promote learning. Bigham, M. T., Logsdon, T. R., Manicone, P. E., Landrigan, C. P., Hayes, L. W., Randall, K. H., … . Sharek, P. J. (2014). Decreasing handoff-related care failures in children’s hospitals. Pediatrics, 134(2), e572–e579. doi: 10.1542/peds.2013-1844. Teunissen, P. W. (2015). 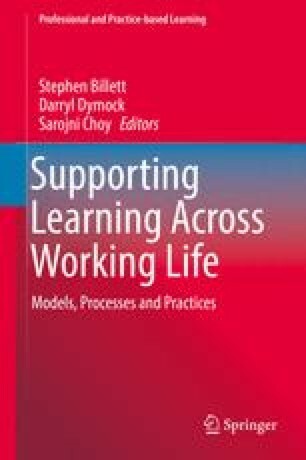 Experience, trajectories, and reifications: An emerging framework of practice-based learning in healthcare workplaces. Advances in Health Sciences Education, 20(4):843–856. doi: 10.1007/s10459-014-9556-y.